Ben Fama is not only one of New York’s rising underground poets; the young artist is also the curator of a visually beautiful guide to. 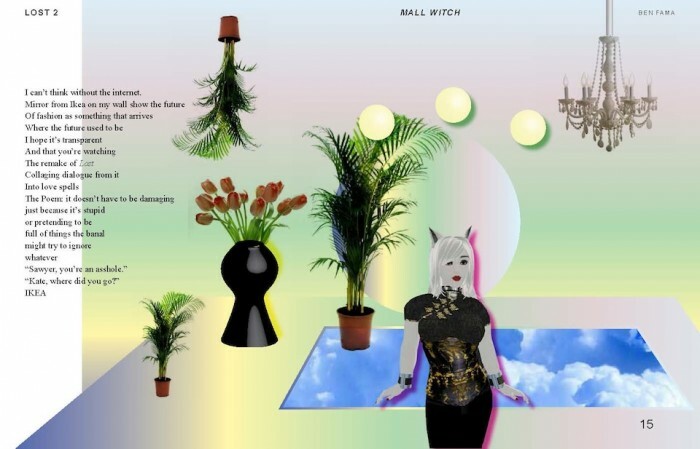 Mall Witch, due out in 200 editions on independent publisher Wonder Press, features Los Angeles artist Kate Durbin on the cover, Fama’s poetry, and the digital artwork of Joseph Kaplan and Paul Legault inside. The book will be released alongside a gallery show also called Mall Witch in New York City’s Culturefix Gallery, on November 1, and will include performances from Silent Drape Runners, B0GYH1GH, Cakes Da Killa (yes, that Cakes), and performance artist Gio Black Peter. Also, if you stare at the diamond in the above image, surprise— Kitty Pryde.